Cucumbers contain most of the vitamins you need every day, just one cucumber contains Vitamin B1, Vitamin A, Pantothenic Acid, Magnesium, Phosphorus, ManganeseVitamin B2, Vitamin B3, Vitamin B5, Vitamin B6, Folic Acid, Vitamin C, Calcium, Iron, Magnesium, Phosphorus, Potassium and Zinc.They contain enough sugar, B vitamins and electrolytes to replenish essential nutrients the body lost, keeping everything in equilibrium. 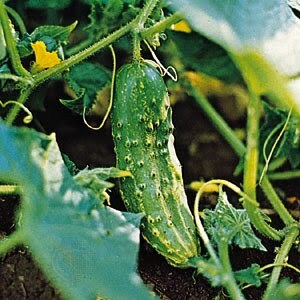 Cucumbers are usually eaten raw in salads or cool dishes or as a pickle. It's especially desirable to use only organic cucumbers, because they are un-waxed, while the commercial ones have a coating of wax. This allows you to safely eat the skin. STORAGE Cucumbers can be kept for a week or so stored in the vegetable crisper in your refrigerator. Use a mandolin to thinly slice cucumber. Mix with rice vinegar to taste. Add salt and pepper. Cut the cucumber and dress it with lime juice and a sprinkling of Tabasco sauce. Cucumbers have a great deal of water, so the flavor of the cucumbers and the dressing will be somewhat more concentrated if the cucumbers are salted. Sprinkle salt on the cucumbers, weigh them and let stand for ½ hour or longer. Taste the cucumbers and if they are too salty, rinse them off before adding the dressing.